How do you capture the beauty of a city which you have been calling home for four years and which, although compact in size, keeps surprising you every day with yet another undiscovered point of view? This was my challenge when, the other day, I sat down to sift through the thousands of photos I have taken of Vicenza, Italy since arriving here in August 2014. I wanted to show you this smaller Northern Italian city in all its unexpected beauty and splendour – from its Roman vestiges and its Palladian heritage to its colourful houses and the tranquil (at least on the surface) day to day life you can quietly observe in its coffee houses and on its piazzas. After hours of browsing through my photo folders, I managed to narrow my selection down to just over 150 pictures and then, after hitting the proverbial wall more than once, eventually I had the final 30 photos ready to share with you. It was a difficult task this combing and selecting, and deleting, and starting all over again and again. Once the final selection was ready, then doubts settled in. Were these my very best photos of Vicenza, I asked myself several times. Were they representative of the city, showing what it really stands for?! Weren’t they a bit repetitive in their topics, their angles, their use of colour?! I thought long and hard and the more I looked at these final 30 photos the more I was convinced that, yes, at this moment in time, they truly represent the beauty of Vicenza the way I have had a chance to see it and experience it for myself over the last four years. My photos may not be perfect from a technical point of view but looking at each one of them brings up a special memory of my life here in Vicenza, Italy and the motions and emotions I went through discovering the city and its many facets. With each photo I picked, I wanted to focus on the loveliness of the city’s streets, squares and sights, on the striking colours of the local houses, on the deep layers of history that vicentini step on and are surrounded with every time they venture out of the house. I wanted to visually recreate for you the very best of Vicenza the way I have been seeing it and discovering it through my lens. The intrigue of the narrow curving streets, the expanse of the main square – Piazza dei Signori, the green of the shutters, the lavish art, the uplifting architecture, the lush shrubs and trees, the unexpected discovery of universal spirituality beyond all the coatings of religious devotion, even the inane graffiti which the Italian youth seems obsessed with scribbling on every historical surface they can get a spray of paint on. So, here I am today, ready to share with you these photos, the memories they stand for and, above all, the beauty of Vicenza – a city I didn’t know anything about only four short years ago and which, today, I feel incredibly attached to. One of the first things which made an impression on me in Vicenza, Italy was the abundance of bicycles and the fact that people of any age and all walks of life were using them daily to get from point A to point B. Bikes are everywhere here and kids start to learn how to ride a bike from a very young age. Often, you see whole families on the road – the kids on their little bikes preceded by their parents on their big bikes. Babies and toddlers, strapped to the plastic seats attached to their mummy’s or daddy’s bike, learn to enjoy the thrill of a bike ride even before they can speak. This bike culture, this total daily reliance on the bike has birthed some curious cultural effects, too. For people feel so secure on their bikes, so totally convinced that the bike is a natural extension of their body that, when it rains, you regularly see people riding their bike with only one hand on the handlebars while the other is holding an open umbrella above their heads. Ladies bike with one hand at all times as the other clutches their shoulder bag. High heels seem to be the perfect footwear for a bike ride around town, too. I love this photo as it represents Vicenza’s dedication to the bicycle. 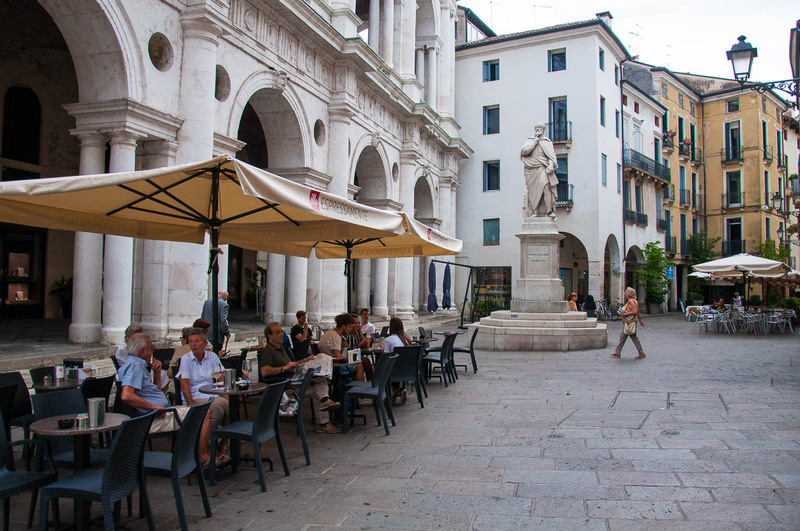 On one side, you can see the bike racks at Piazza dei Signori – Vicenza’s main square and beating heart. On the other are the tables and chairs of the nearby coffee shops and bars inviting you to sit down and partake in another big part of local life, i.e. the alfresco cafe culture. And at the back, you see the beautiful historical houses which line up the piazza giving it with their bright colours a very happy, energetic feel. In Italy, obviously, you would expect to see art everywhere. You may even be a bit blase when you talk about your art excursions on Italian soil. Ah, you’ve seen the Caravaggios and the Michelangelos, the Titians, the Tintorettos and the Bellinis. That’s it, you’ve done it all! And yet, art in Italy is not just the big names we all have memorised be it from a quick lesson at school or a quick read-through of an online article. Art is such a big part of life here, such a constant presence, such an unavoidable reality that soon you get used to being surrounded by beauty in all forms and shapes at all times. After a while, you realise with some surprise that it doesn’t really matter who the artist is and how conventionally famous he is. You quickly learn to look beyond the name, to appreciate art for the beauty it brings to your life, for the emotions it stirs in you rather than for the cool factor it will bestow on you when you discuss on social media the worldwide famous works you have glimpsed. I took this photo in one of the rooms of the Palladio Museum in Vicenza, Italy. This is a small portion of a lavishly decorated ceiling with frescoes and stuccoes that you can spend an hour gazing at and still, you won’t be able to see and notice every single detail that there is. To be honest, I don’t know the names of the people who painted and moulded this work of art. And even if I knew them, I doubt that I would know much about them. Yet, I love the beauty of this ceiling, its lavishness, its over-the-topness (if you excuse my attempt at coining a new word). I love it that just in the room next door there is another even more lavish ceiling and then in the room next door the ceiling is yet more lavish again. And so on. And so on. This exuberance of art and its omnipresence are inspiring and give me peace of mind by making me truly believe that beauty really will save the world. 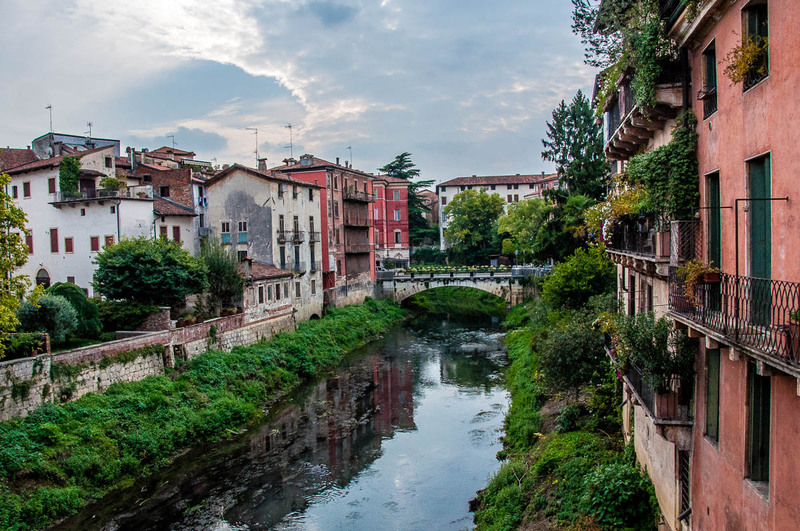 This is the river Retrone which cuts through Vicenza’s historical centre. There is another river which meanders through Vicenza’s centro storico, too. Its name is Bacchiglione – I still find it difficult to pronounce and have to double-check my spelling every time I write it in a blog post. 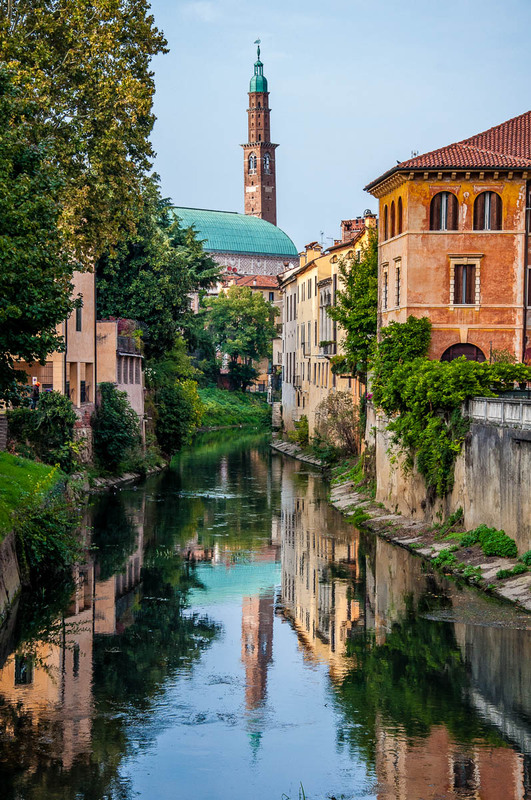 Vicenza’s two main rivers and several water canals (some of which once were rivers, too) are intrinsically connected with the city’s history. Centuries ago when water transport was cheaper and more secure than carrying goods by road, boats loaded with herbs and spices would reach Vicenza from Venice thus stimulating the rapid growth and enrichment of the city. I love walking by Vicenza’s rivers and canals. They offer some of the most inspiring views of the city. When it rains, their beds fill with water and the rest of the time their banks are covered with lush shrubs and grasses – the perfect ground for ducks, nutrias and some of the most ferocious mosquitoes this side of Italy. This particular view from the San Paolo bridge in Vicenza is a personal favourite of mine. I love the colour of the large building on the left-hand side. It looks beautiful against Vicenza’s blue sky. 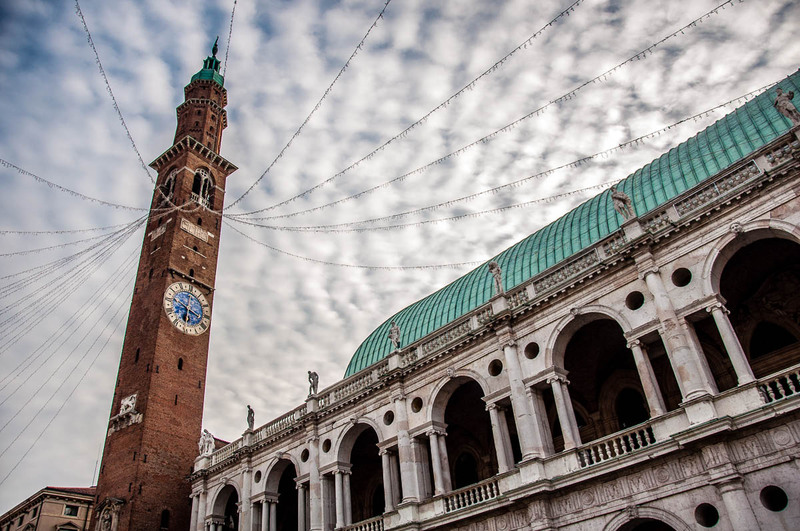 This is Piazza dei Signori – Vicenza’s main square and living, beating heart. There are so many angles from which to admire and photograph the stunning architecture and majestic ambience of this beautiful square. I particularly like this point of view. What you see at the front of the photo is the base of one of the two pillars which grace the east end of Piazza dei Signori. One is crowned by the majestic Venetian lion (indicating Vicenza’s allegiance to the Republic of Venice) and the other – by a statue of Christ the Redeemer. The two pillars are an iconic site in the city. Countless dates and meetings have been arranged at their carved stone bases. 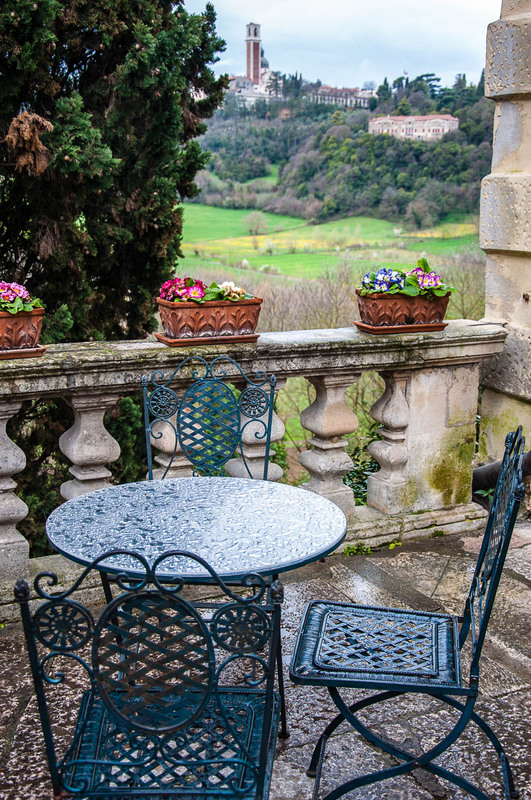 People often sit on them to enjoy the splendid vista and to amiably chat with one another. And kids love to run around the pillars and to climb up all over their tiered bases with their parents keeping a watchful eye over their every daring move. 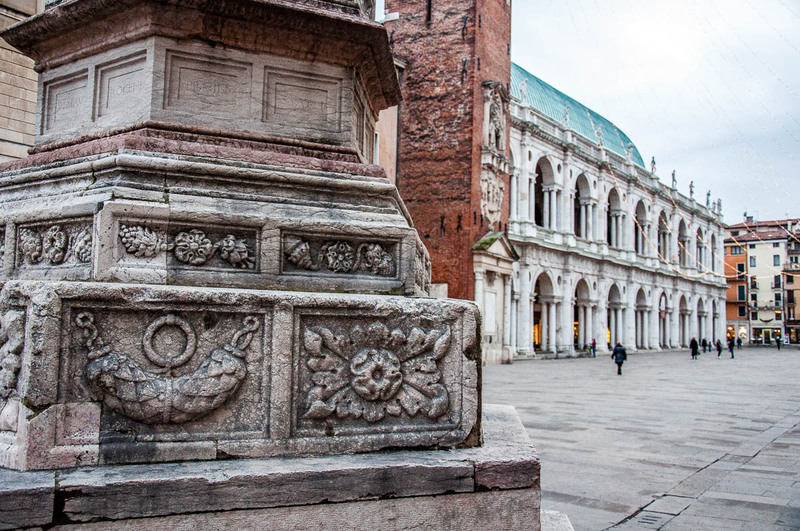 It is really lovely that these pillars that have seen so many historical events during the several centuries that they have spent at Piazza dei Signori keep being a focal point for Vicenza’s community. 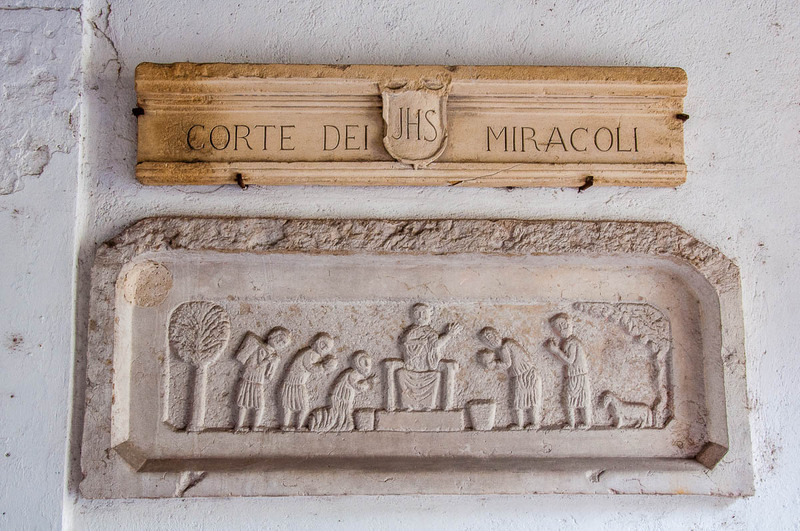 The Corte dei Miracoli is a courtyard peppered with old statues and bas-reliefs. I came upon this intriguing place in the historical centre of Vicenza by pure chance. I was walking down a street when I looked to my left just as I was passing by one of those huge gates that lead into an atrium which opens onto an inner yard shared by several apartments. The gate was wide open and on the atrium’s wall, I saw the bas-relief photographed above. The name – Court of Miracles – captured my imagination and, without thinking much, I walked inside. There were old pillars, statues and bas-reliefs all over the walls of the atrium and in the courtyard. I was particularly taken with some rectangular bas-reliefs there featuring chiselled stone faces with incredibly large mouths. I wondered if they had served as early postboxes or as the artistic endings of ancient spouts. There was no-one around to ask what the Court of Miracles – a wonderful and whimsical place – was. All my attempts to find more information about it online were fruitless. It remains one of my favourite spots in Vicenza. Very intriguing! You can almost imagine it being a portal into an ancient world. This is an Early Medieval fresco depicting the Last Judgement. 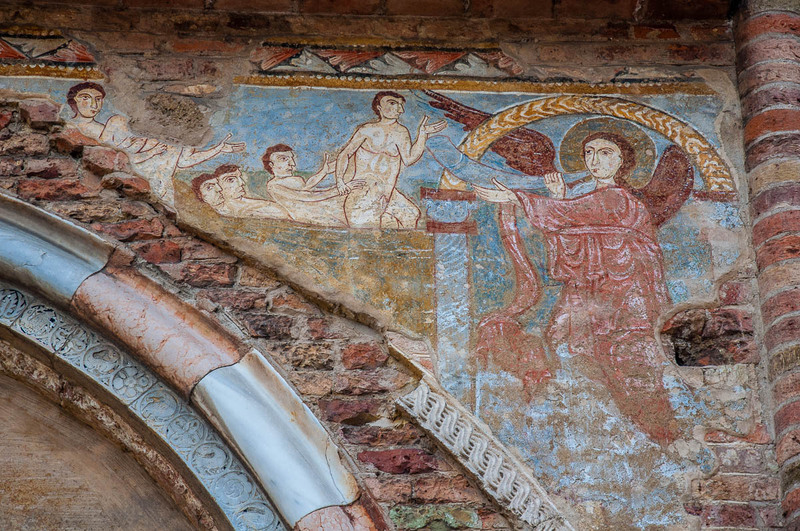 You will find it on the facade of Vicenza’s oldest church. Called Chiesa dei Santi Felice e Fortunato, it dates back to the 4th-5th century AD with alterations and restoration works performed several times since then. Visiting this church was a very profound experience for me. There were no other people there when I opened the church’s heavy door. I spent over half an hour simply sitting on a chair inside just taking it all in and thinking about my grandmother who had recently passed away. The church has an all-enveloping atmosphere and it is quite astonishing to think that people had been congregating at that same spot for so many centuries. Even if you are very pragmatic at heart the energy inside this sacred place is palpable. The floor is open in the middle of the church to show the paleochristian mosaics underneath – a vestige from the very first church building erected at that site. The walls keep remnants of old frescoes and outside there is a little museum with further information about the church. Every little detail there tells a story. My visit to the Chiesa dei Santi Felice and Fortunato left me feeling like I truly could connect with something on a deeper level that words can’t express. 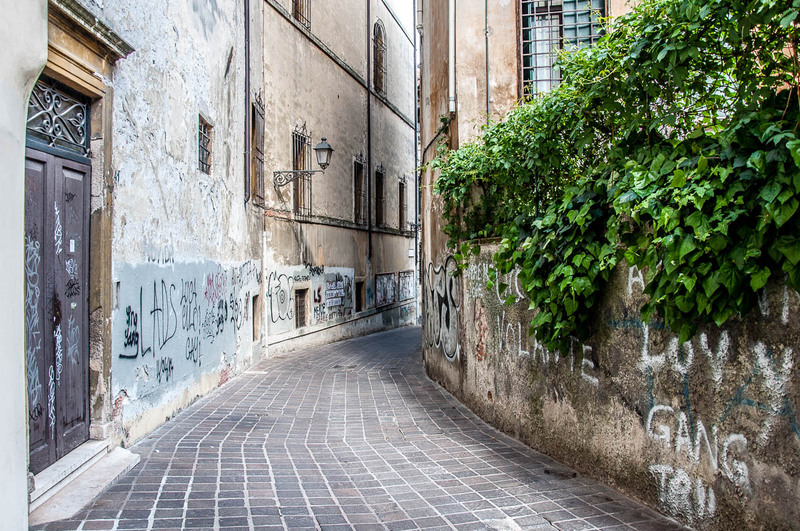 Vicenza’s curving streets awake the explorer in me. No matter how many times I may have traversed each and every one of them, I always wonder what will be there on the other side, beyond the curve, when I stroll past it. The centuries-old pavement is caved and warped. The old peeling walls are speckled with inane graffiti. Usually, there is no-one around. Often, it feels like one wrong step and I will fall through a wormhole into a century of past glories when torches instead of electric lanterns lit up the street and the proud palazzi which line it up. This is the view from the terrace of the cafe of Villa Valmarana ai Nani. It is my secret fairytale place where I can sit for hours just taking in the splendid outline of Mount Berico and the green Valley of Silence while slowly drinking my black coffee. Unfortunately, I rarely feel like making the half an hour trek to this beautiful place. This photo reminds me of what I am missing on those days when I really can’t be bothered to go for an energising walk. 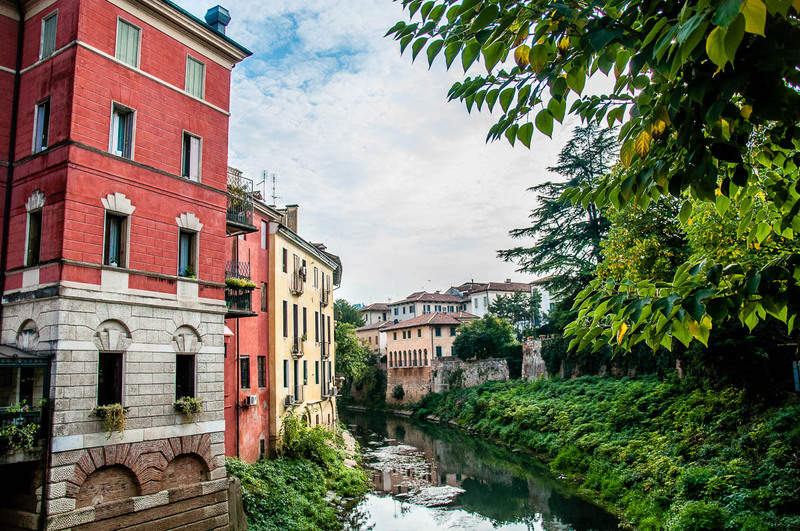 With two main rivers and several canals crisscrossing Vicenza, the city also has many bridges. Definitely not as many as Venice but enough to serve as a point of reference in terms of local history, daily life and photo opportunities. This is the San Michele bridge. Built between 1621 and 1623, it is considered to be the most beautiful bridge in Vicenza, Italy. It was designed by the architects Tomaso and Francesco Contini who also worked on the Rialto bridge in Venice. According to Vicenza’s mythology, the German poet and philosopher Goethe himself fell in love with the elegant San Michele bridge when he visited the city in September 1786. The bridge is very romantic, indeed. Covered in oval pebbles, it stands on the cross point of the rivers Retrone and Bacchiglione and is right next to tall houses the balconies of which drip with blooming flowers all summer long. Stepping on San Michele bridge immediately transports me back in time when Vicenza was at her heyday thanks to its historical silk and jewellery traditions and the architectural legacy of Andrea Palladio. The Tower of Torment has a fabulously evocative name and not such a great history. After all, it used to be a prison. The tower was originally built in the 12th century to serve as the residence of a noble family. In the 13th century, it was repurposed, so for hundreds of years, it housed not just the criminal minds of the time but also the local civic archives and registry. 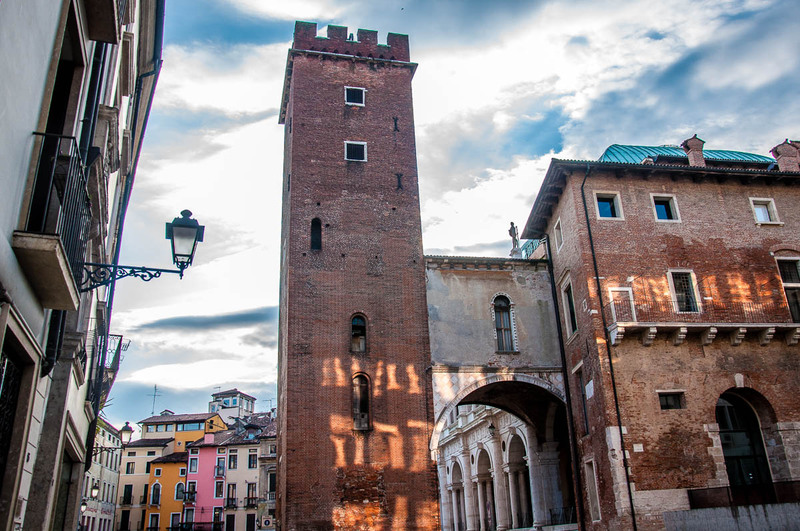 You will find the Tower of Torment on Piazza delle Erbe, just behind the Basilica Palladiana. Both the basilica and the tower are connected via an arch called Arco degli Zavatteri which was built in 1494. 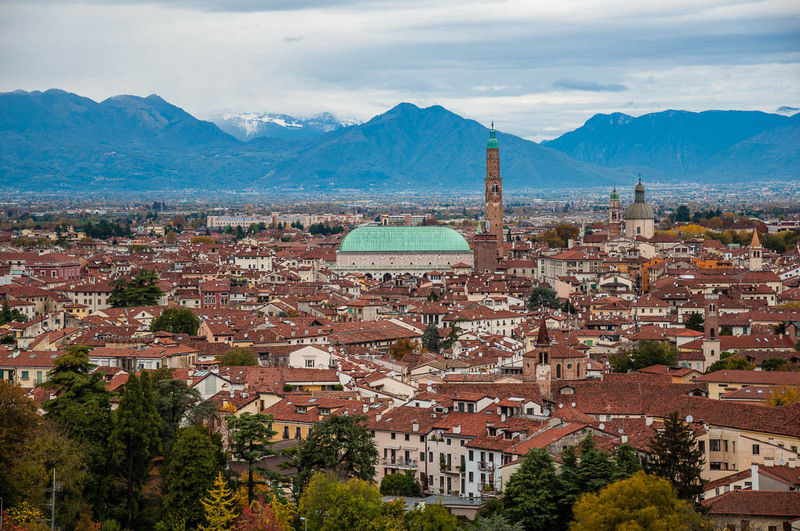 Apparently, in the Middle Ages, there used to be over 100 residential towers in Vicenza. Nowadays few survive and among them, the Tower of Torment has the most splendid location. I have photographed it many times and this photo gives a good idea of the tower, its mighty presence and the beautiful surroundings in which you will find it. For some reason, green is a very popular colour in Vicenza in terms of wooden shutters. If you look at the shutters on the historic houses and buildings in town, you will notice that they are overwhelmingly green. ‘Why is that? !’, I asked only yesterday a nice Italian couple whom I had the chance to get to know recently. ‘It just looks good!’, they said. I don’t know if this is the actual and/or full reason. In all honesty, I was expecting them to say that green was chosen because it repels light or diminishes the strength of the sun rays or another such pragmatic thing. Instead, I loved it that the reason to choose green for shutters all over Vicenza can be something as simple as aesthetics. But, this is Italy after all! Beauty rules. So, yes, green shutters. They are everywhere and they look so beautiful, authentic and photogenic. Especially if they are slightly faded which, in most cases, they are. I can’t resist them. I spotted this combo of a green door and a green window on the top floor of the Palladio Museum in Vicenza. I liked the symmetry of the columns, the faded colours, the shadows on the building seen through the opening in the wall. So, I snapped the scene. Here it is! Green shutters. If you haven’t noticed them so far, I bet you that all you will be seeing from now on all over Vicenza will be houses with green shutters. A coincidence or what?! It doesn’t snow often in Vicenza but when it does it pulls out all the stops. This is Parco Querini – a green oasis with a circular pond and an islet. It looks splendid covered by snow, doesn’t it? If you want to see more photos of Vicenza in the snow, please, click here. 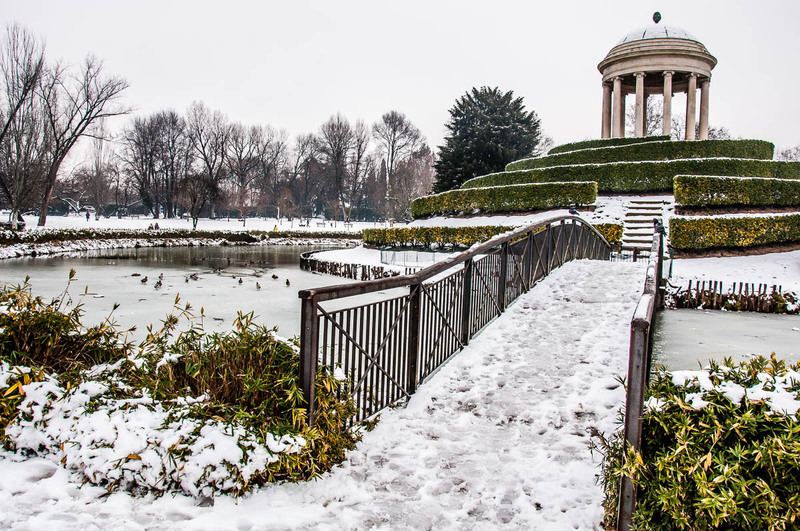 And here is a short blog post about Parco Querini and what you can see and do there no matter what the weather is like. 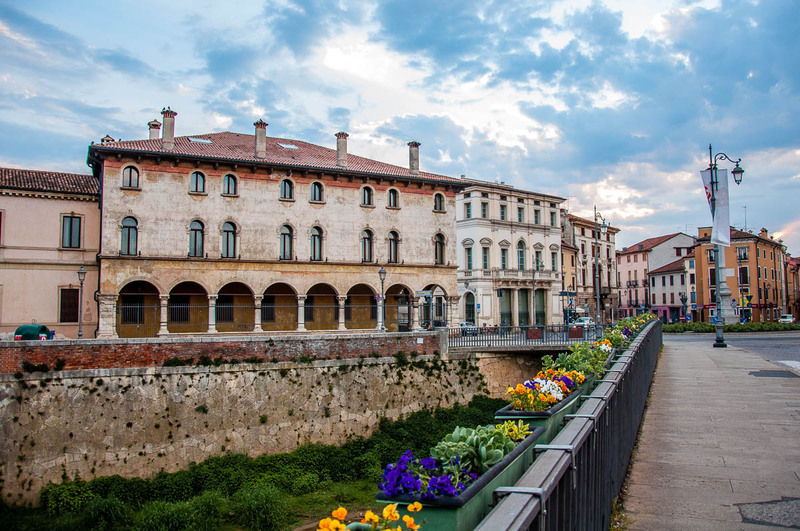 This is the Basilica Palladiana – Vicenza’s most famous building – seen from the Furo bridge. Ponte Furo was built originally by the Romans in the 2nd century and it was then enlarged and strengthened during the Middle Ages. Looking at the buses which trundle through it every few minutes nowadays, you cannot help it but admire the genius of the Roman and the medieval architects and builders. Yet, you may actually have little time and chance to entertain such thoughts. 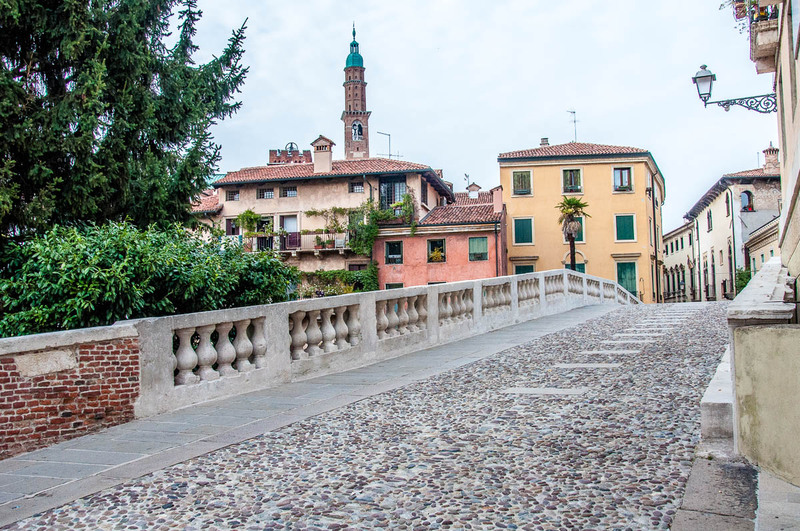 For the Furo bridge is the ideal spot to admire Vicenza’s most iconic view of the Basilica Palladiana. The Basilica was designed by Andrea Palladio – the most lauded Western European architect of the last 500 years who is also officially recognised as the Father of American Architecture. The Basilica was its first large commission and the one which cemented his reputation. 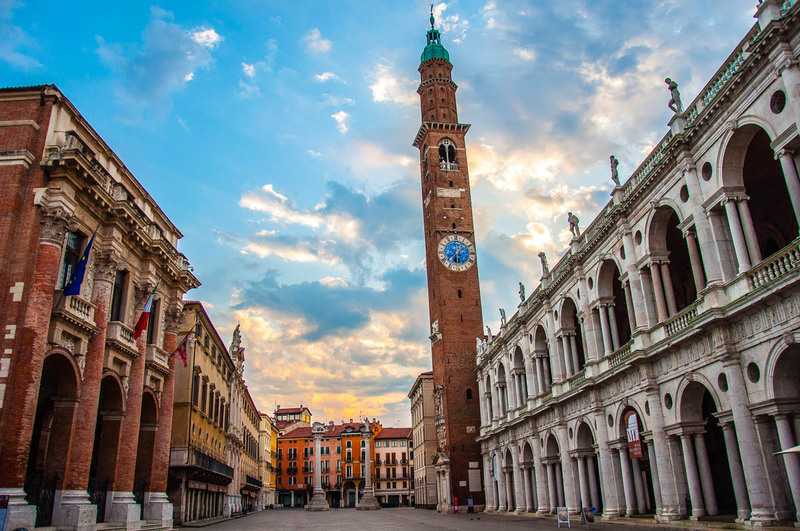 Vicenza, Italy is home to 23 of Palladio’s buildings and since 1994 the city has been inscribed in UNESCO’s World Heritage List thanks to its incredible architectural heritage. I have tried on several occasions to do this beautiful view justice with my camera. I was finally happy with how this picture came out. 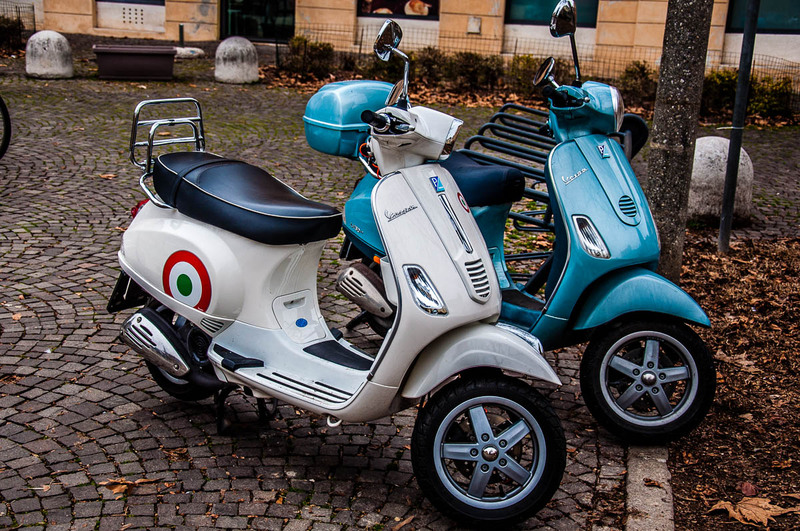 It wouldn’t be Italy without scooters! So, I’d like to assure you that I have been taking every opportunity to snap little Piaggio’s and Vespa’s in picturesque surroundings. 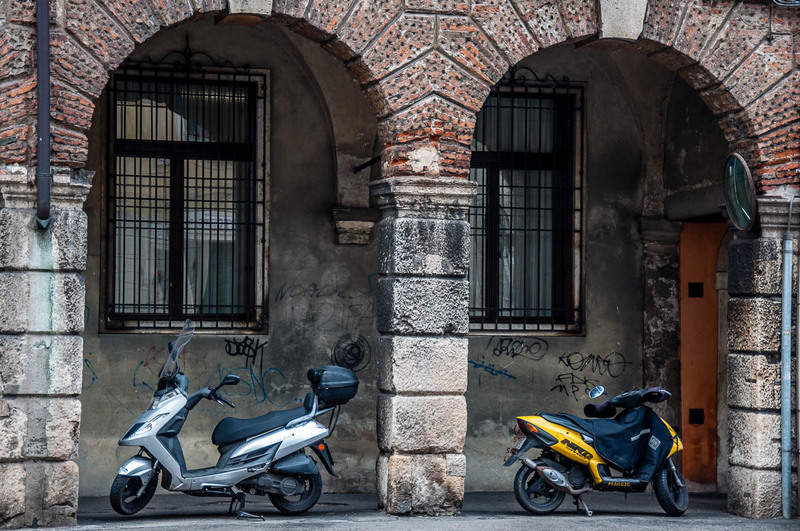 Here are two little scooters (isn’t the cover on the yellow one just the cutest thing?! it’s like a little blankie!) faithfully waiting for their owners to return and drive them round the streets of Vicenza. I found myself here by complete chance. This is the Abbey of San Pietro in Vicenza. Behind me is the entrance to a 15th-century chapel used by the choir of monks for rehearsals. To my right is a heart-warming fresco of a Breastfeeding Madonna which was the original reason for me to come to this sacred place. But this passage here in the photo is completely in a league of its own. Don’t you just feel like time has stopped here?! And at the same time, looking at the faded colours and the frescoed details that have bled in the walls thus losing in the process their shapes and hues, don’t you feel acutely the passage of time, too?! Ponte dei Angeli – the Bridge of Angels – is another notable place in Vicenza. Straddling the river Bacchiglione, its location dates back to Roman times, although the bridge itself has been rebuilt and modernised on several occasions since then. The local council regularly changes the blooms in the planters fixed to the railings of the bridge thus providing an ever-changing array of colours to capture in a photo or two. 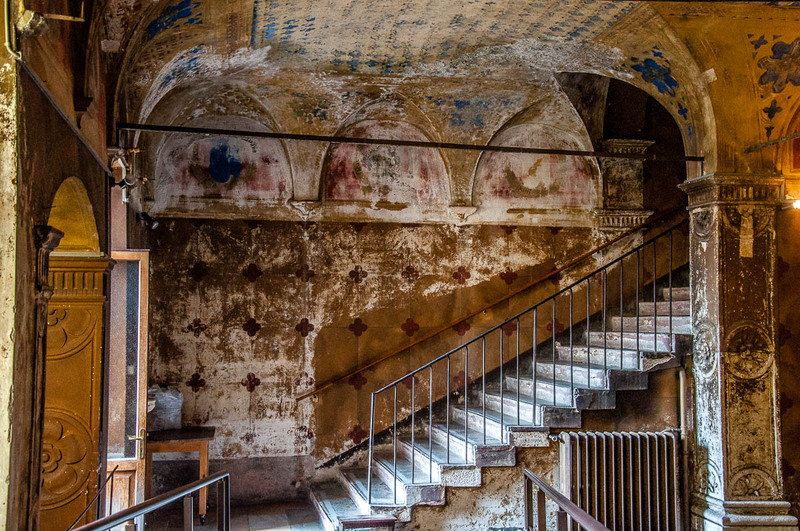 Beyond Ponte dei Angeli, you can see Palazzo Angaran – a 15th-century faded frescoed beauty which, unfortunately, seems a bit abandoned nowadays. I never fail to steal a glance at it imagining what it must feel like living there. I would really like it if, one day, I can see the palazzo’s dusky rooms for myself. Usually, there is a flock of pigeons right on the palazzo’s rooftop. When the pigeons are there, they take a group flight at regular intervals circling the adjacent roundabout and then return to the roof. If you look down at the river, also usually, there is a family of ducks which fishes for lunch in the green water. Even though the photo above has a sense of peace and tranquillity to it, in fact, Ponte dei Angeli is one of the busiest spots in Vicenza. Buses trundle past, cars and vans drive through thick and fast, people cross the bridge in that direction and the other on their way to the historical centre or back to where they live. It’s a crossroads in more ways than one. As much as I love Palazzo Angaran and all the other palaces all over Vicenza, if I was really hard-pressed to choose my very favourite one among the bunch, after much thought and consideration I would always choose Palazzo Regau’. 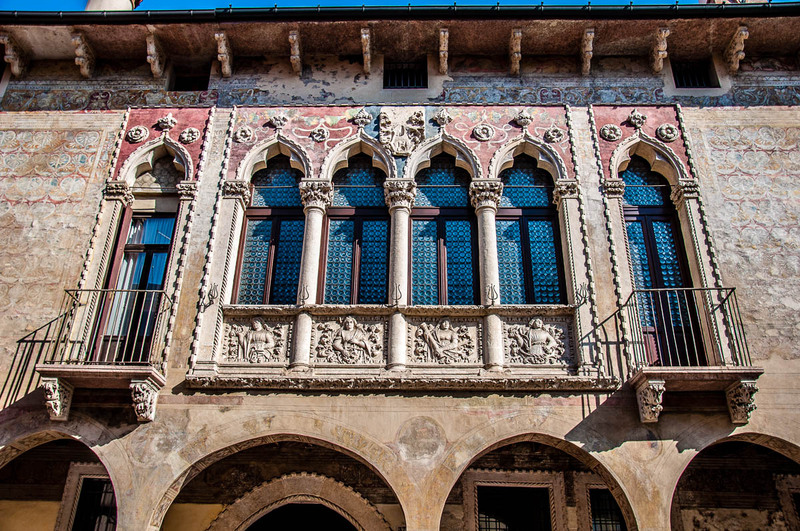 Built towards the end of the 15th century by a cloth merchant, the palazzo’s late Gothic facade is a wonder to behold. It has all the artistic and architectonic details that make my heart swoon. Faded frescoes – tick. A Venetian quadrifora window – tick. A shady portico with elegant arches and a ceiling with supporting wooden beams – tick. Plus, if you look really carefully at the frescoes right underneath the eaves, you may spot some weird and wonderful depictions of a camel and what looks very much like dinosaurs! Yes, dinosaurs on a Venetian palace. That’s quite something, right?! You may wonder why there is a mulberry tree in the courtyard of the Palladio Museum in Vicenza, Italy. The surprising answer is that the humble mulberry tree facilitated the growth of Vicenza to the point of the city becoming a centre of European architecture and art. Mulberry leaves mean food for silkworms and silkworms mean silk. The production of silk fabrics in Vicenza in the 16th and the 17th centuries was such that the city, in spite of its compact size, quickly amassed unimaginable riches which the local textile merchants promptly invested in the construction of sumptuous palaces and splendid collections of art. The tree in the courtyard of the Palladio Museum in Vicenza reminds us that at the base of it all was something as simple as mulberry leaves and silkworms. I love popping in to check on the tree every season. I have photographed it with its naked branches outstretched towards the grey winter sky and with its green shoots happily swaying in spring. Here, you can see it in all its late summer glory. The tree’s leaves are just starting to turn bright yellow as autumn is just around the corner continuing a never-ending cycle of birth and death. Dressing up and looking all nice and presentable is a way of life for Italians. You won’t catch anyone dead shopping in their onesie or popping out to drive the kid to school in their pj’s. It is quite nice, really, to sit down outside to have a coffee and to people-watch admiring everyone’s attire (ironed and nicely colour-matched), the ladies’ statement jewellery and the gents’ polished to a mirror shine shoes. Not to mention the obligatory scarves. Knotted around necks, thrown over shoulders, layered on top of the breasts. Italian do really have a special love affair with scarves. I often fantasise about having the social chutzpah to stand in Piazza dei Signori and ask the very well-dressed people of Vicenza to pose for my camera. As I haven’t had the courage to do it yet, here is the next best thing. This lovely couple and their fantastic headwear made an impression on me on a visit to the fully frescoed Villa Valmarana ai Nani – one of the most beautiful Venetian villas on the outskirts of Vicenza. 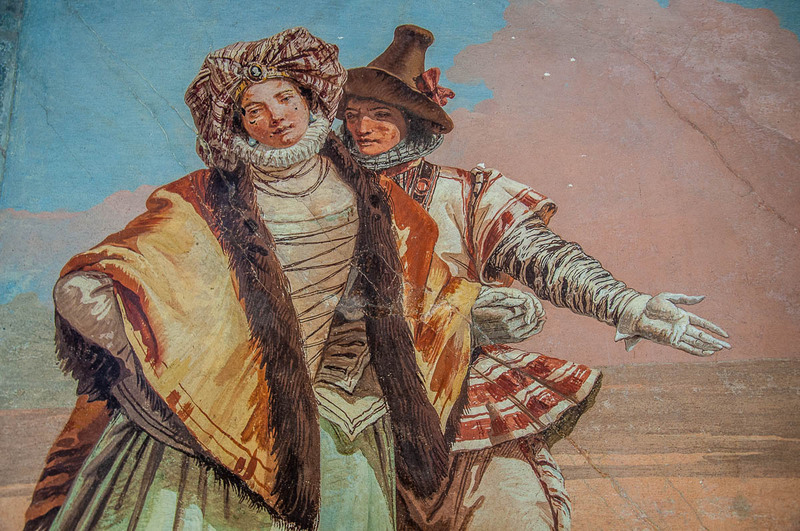 With a fresco cycle authored by father and son Tiepolo, it’s a sight you cannot miss if you want to discover the beauty of Vicenza for yourself. In the atrium of Palazzo da Schio (also known as Ca’ d’Oro) there is a nice lapidarium collection of stone artefacts telling stories dating back to ancient times. There is a Vth century marble sarcophagus, epigraphs and amphoras among other things. 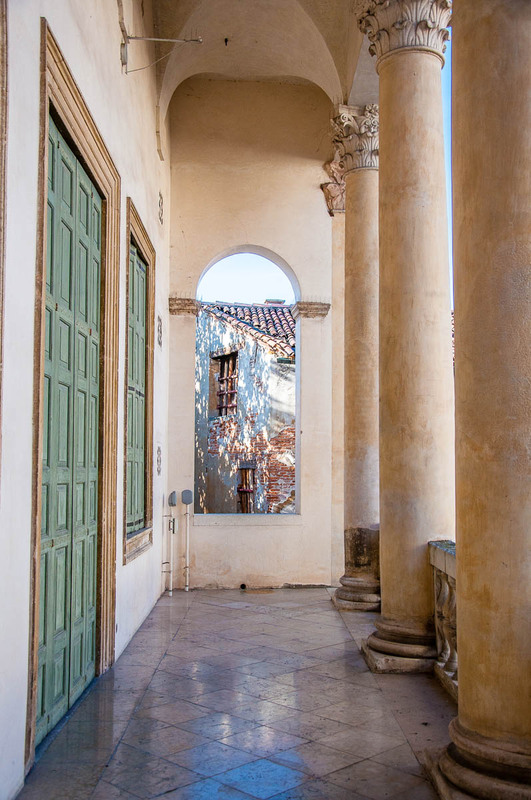 The atrium is always bathed in dusk and it’s a nice stop along Vicenza’s main street – Corso Palladio – especially on a stuffy hot day when you want some respite from the sun for your body and eyes. 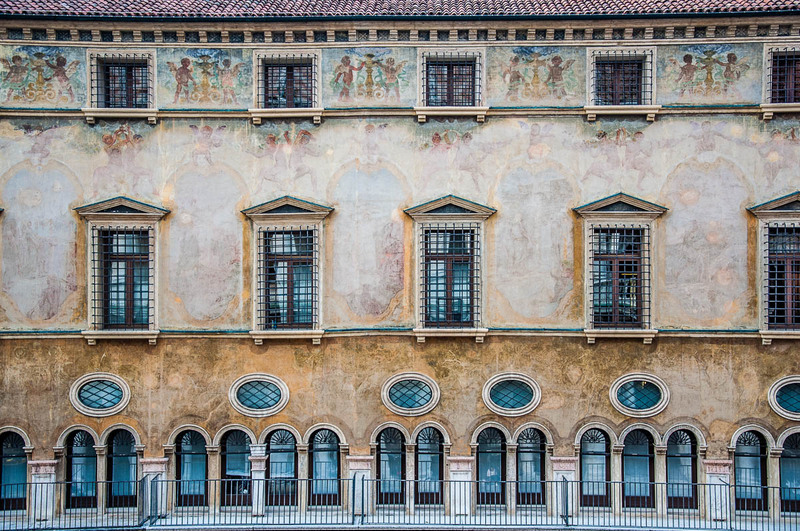 Plus, Palazzo da Schio (Ca’ d’Oro) has one of the most beautiful facades in Vicenza. Just past the atrium, there is a very atmospheric courtyard with a wisteria tree which climbs up to the top of the building draping its several floors with an abundance of purple blooms in spring and early summer. In the atrium, you can also see the large window display of my favourite bookshop in Vicenza. It has a great collection of art and cookery books and everything is discounted. I love spending time there every now and then picking a new addition to my small collection of books in Italian. 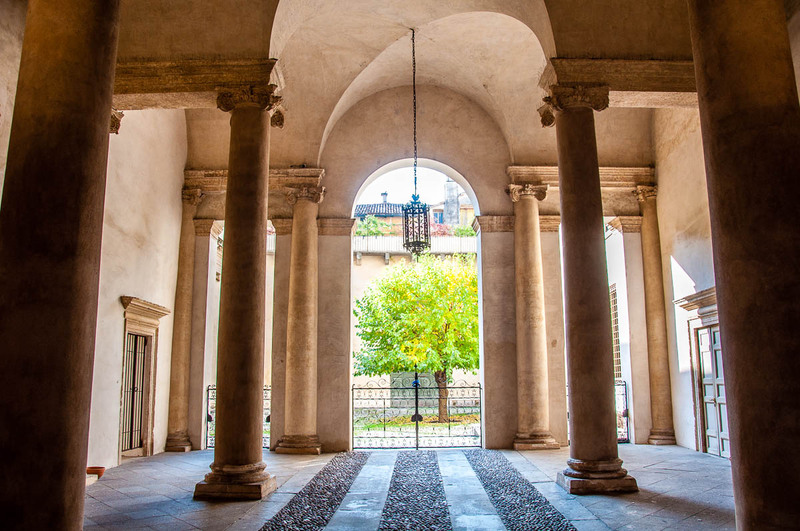 The photo above represents my eternal struggle to capture the atrium of Palazzo da Schio (Ca’ d’Oro) in Vicenza, Italy in all its beauty in spite of the different levels of light – from the harsh light which streams from the street through the dusk inside the atrium to the muted light in the enclosed courtyard. Corso Palladio is Vicenza’s main street or Vicenza’s high street (if you would prefer the British term). 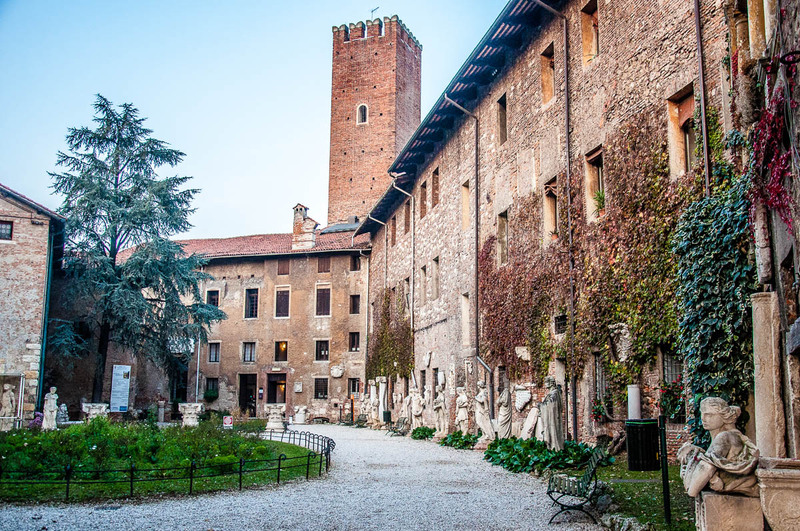 It crosses the city’s historical centre from the fabulous Teatro Olimpico to the preserved medieval gate Porta Castello. 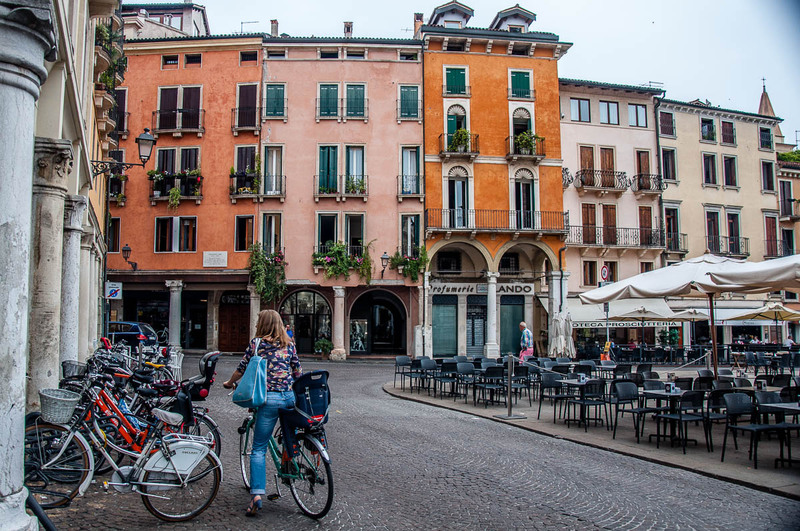 Boutiques and brand shops are dotted along Corso Palladio, Venetian palaces line it up on both sides and tall colourful houses fill up the gaps. The most interesting thing about Corso Palladio though is that it follows the exact line of the ancient Decumanus Maximums – the main road of Vicenza in Roman times (when the city was actually called Vicetia). The urban plan of Roman cities was traditionally a grid made of streets (Decumani) running from east to west. These were perpendicularly crossed by the Cardini – streets that stretched from the north to the south. The Decumanus Maximus was the main street which in the case of Vicenza led to Aquileia to the east and to Verona to the west. I have walked the length of Corso Palladio thousands of times during the last four years. It is a very beautiful street and I keep discovering new details along its historical course. 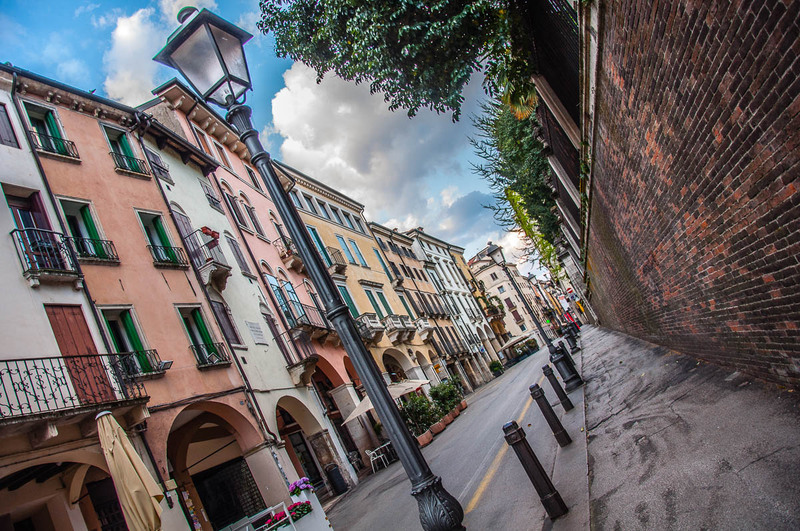 This photo shows Corso Palladio from a slightly untraditional tilted point of view. On one side it’s the brick wall surrounding the garden of the adjacent Santa Corona Church and on the other side, you can see a portico and several tall colourful houses which are typical for this street. This is one of my most favourite buildings in Vicenza, Italy. If you click on the About page of my blog, you will see that my picture there was taken right in front of this building. 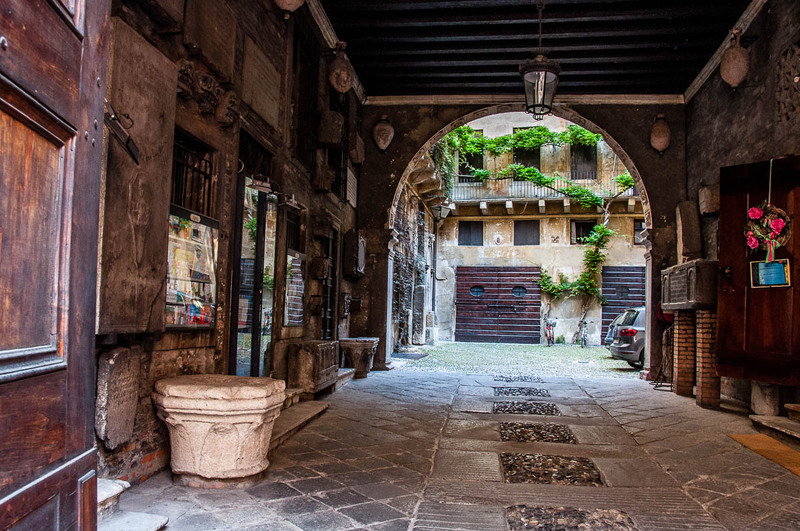 Its name is Palazzo del Monte di Pieta’, it was built between the 15th and the 17th centuries and you will find it on Piazza dei Signori in the historical centre of the city. Its facade is 72 metres long and, for me, it’s a perfect representation of beauty. It’s frescoed, symmetrical and even though it’s weather-beaten, it still holds its face up proudly looking forward. Oratorio dei Boccaloti is a small rather plain building on the outskirts of Vicenza’s central part. I had never seen it open until one day I passed by right after morning mass had just been held. There was no-one inside and I walked in to look at the frescoes and just to sit in peace for a little bit. The oratory was built at the beginning of the 15th century and it feels ancient inside. The frescoes are so old that their outlines have become smudged. In parts, the painted scene is impossible to decipher. The most important thing for me though was how peaceful and calm the place felt. With prayers being offered on a daily basis there for centuries, the small room felt pure and filled with good thoughts. I could easily stay there for a very long time just sitting on a chair and enjoying the sunrays which were dancing on the old frescoes. During World War II Vicenza was bombed and the city’s cathedral was one of the main casualties. Its whole body was destroyed. Only the cathedral’s 16th-century facade survived. After the war, the cathedral was quickly re-built. Curiously enough, during the reconstruction and restoration works, an exciting discovery was made. The ruins of Roman houses, a Roman road and the foundations of Vicenza’s first Christian cathedral were unearthed. Nowadays, they can be visited on a guided tour organised by the city’s Diocesan Museum. It just goes to show that when big life events strike us hard, the best in us survives the challenges and hardships while hidden depths that we didn’t know we had come to the surface to help ground us and feel more stable. Any way you look at it, the Basilica Palladiana in Vicenza is striking. Perfectly symmetrical, its large body seems airy and light. Right next to the basilica stands Vicenza’s tallest tower. Torre Bissara is 82 metres high and it was originally built at the end of the 12th century. A terrible earthquake destroyed it in the 14th century and in the 15th century, it was built again reaching its current height. Spend some time at Piazza dei Signori and you will hear the five bells of the Torre Bissara marking the passage of time. They ring every half and full hour and then, they also mark the ninth hour. In other words, at seven minutes before midday and before 6 pm they perform a little melody composed by Pierangelo Valtinoni – an organ-player, a choir director and a composer born in the nearby town of Montecchio Maggiore. It is a great wish of mine to scale the Torre Bissara. Unfortunately, I have been told that the tower is closed to the public. In the photo above you can see it decorated with Christmas lights which make the whole scene even more beautiful. Having coffee or an aperitivo alfresco is a big part of Italian daily life. How can you say no to sitting outside surrounded by splendid architecture and relaxing in the company of people dear to your heart?! Overlooking the coffee and aperitivo proceedings here is Andrea Palladio himself. Or his statue, if I have to be precise. Vicenza owes much to Palladio and his architectural genius. The Palladian style started here, in this smaller Northern Italian city sandwiched between Venice and Verona. So, don’t miss Vicenza in your exploration of Italy and when you make it here, have a drink in the company of the big man himself. 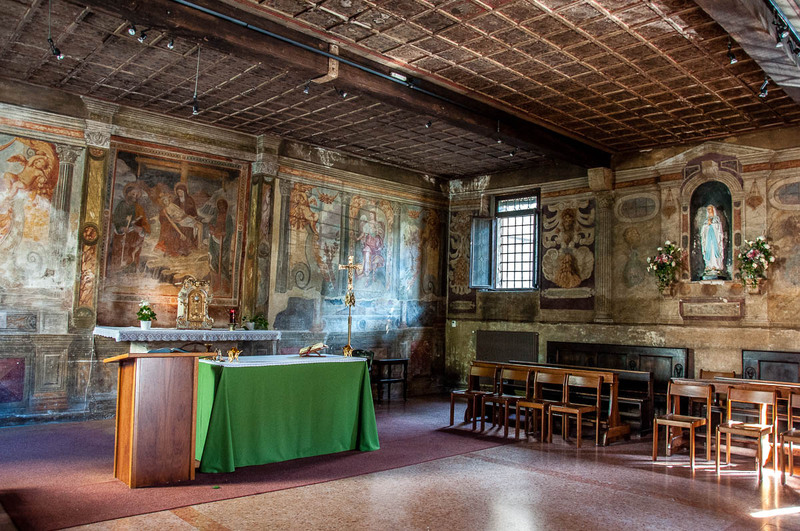 The Chapel of the Holy Thorn is a very special place in Vicenza, Italy. 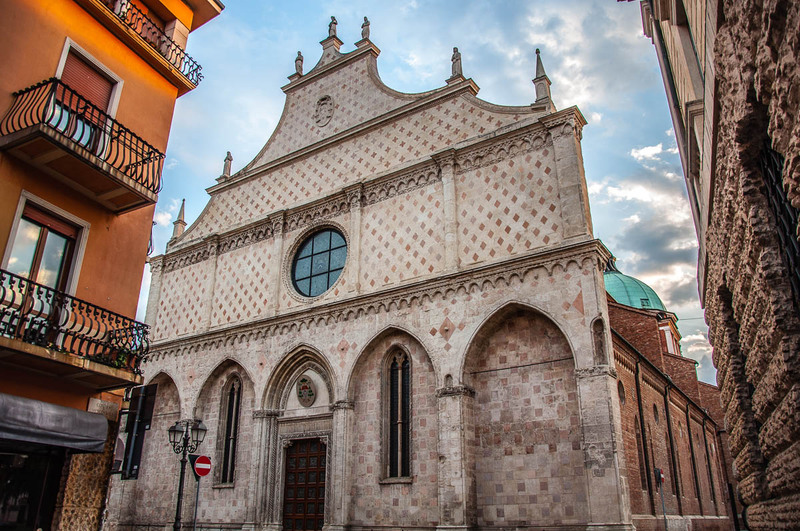 You will find it inside the Chiesa di Santa Corona – a splendid church which stands out with its paintings by Bellini and Veronese in addition to several fully frescoed chapels and a lavish pietra dura altar which took 27 years to complete. Yet, among all those masterpieces, the Chapel of the Holy Thorn takes the prime place. After all, this is where every Easter a thorn from Christ’s crown is shown to the public for the duration of the festivities. Obviously, you decide if you believe in the historical veracity of the thorn or not. 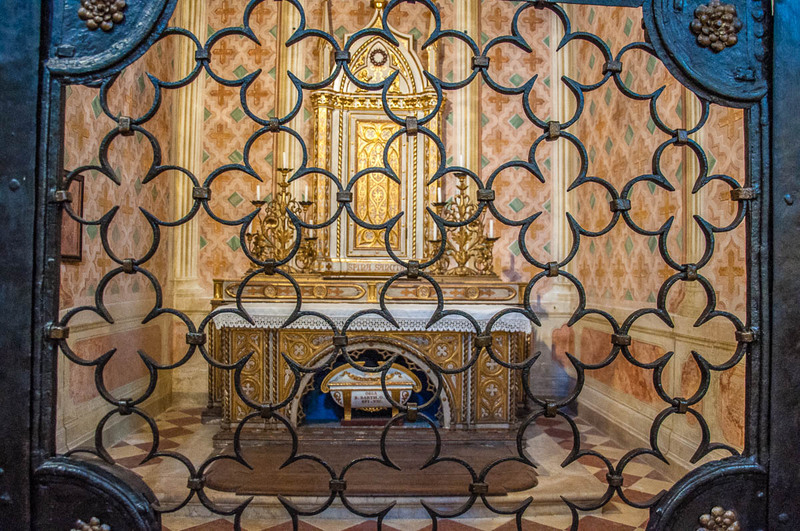 The thorn was given to the Bishop of Vicenza, Beato Bartolomeo da Breganze in 1261 by Louis IX, King of France. The Church of Santa Corona was built to house the holy relic. Nowadays, the thorn is incorporated in a splendid reliquary which, for most of the year, is kept in the nearby Diocesan Museum and for Easter is returned to its original place in the church. 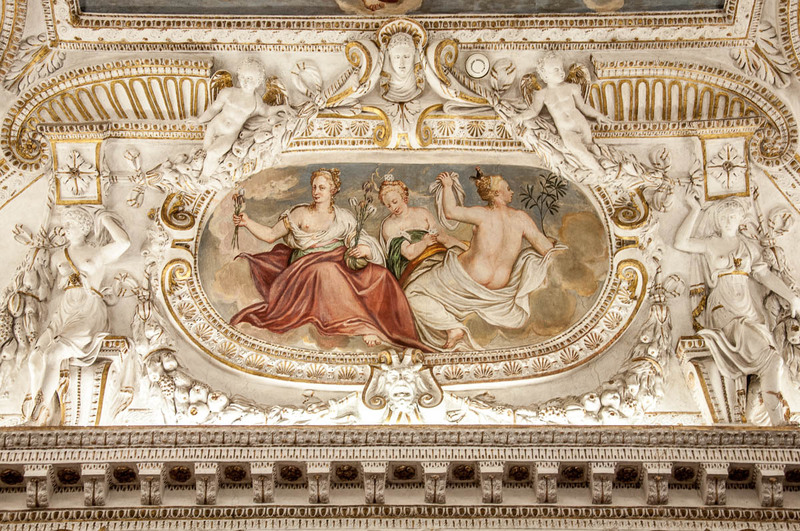 I cannot be talking about the beauty of Vicenza and not dedicate an entry to the city’s Teatro Olimpico. This is a theatre built over 430 years ago. It has an elliptical auditorium lavishly decorated with statues and bas-reliefs. It is housed in a former fortress which at one point was used as a prison and then as a gunpowder warehouse. The theatre was Palladio’s last large project and it was finished after the great architect’s death. The most amazing thing about Teatro Olimpico though is its stage set which is the oldest in the world still in use today. The permanent decors are shaped like the ideal city and the clever use of perspective makes it seem like the city streets disappear far away in the distance with the houses on both sides of the streets getting smaller and smaller the further away they are from the front of the stage. 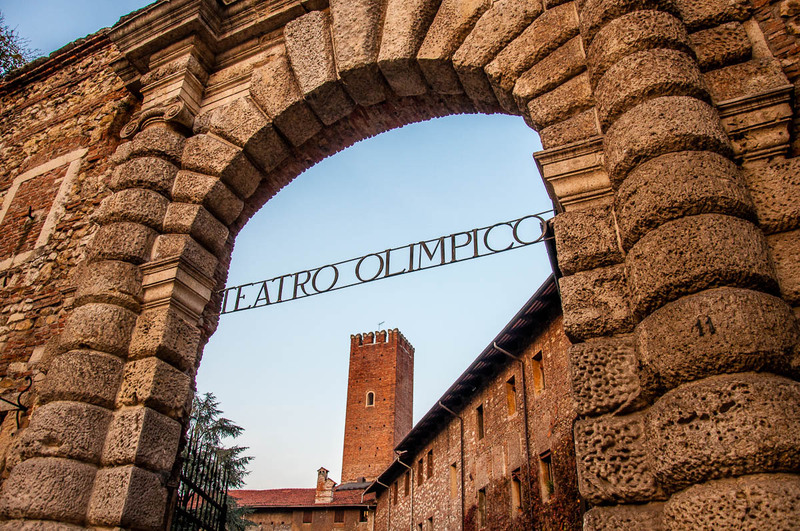 Stepping through the stone gate of Teatro Olimpico is like stepping into a magical world. First, there is a small garden dotted with whimsical stone figures. Once inside you walk through a room covered with frescoes painted to look like chiselled marble. And then, after navigating a dark corridor, you enter the auditorium and you feel your breath taken away. 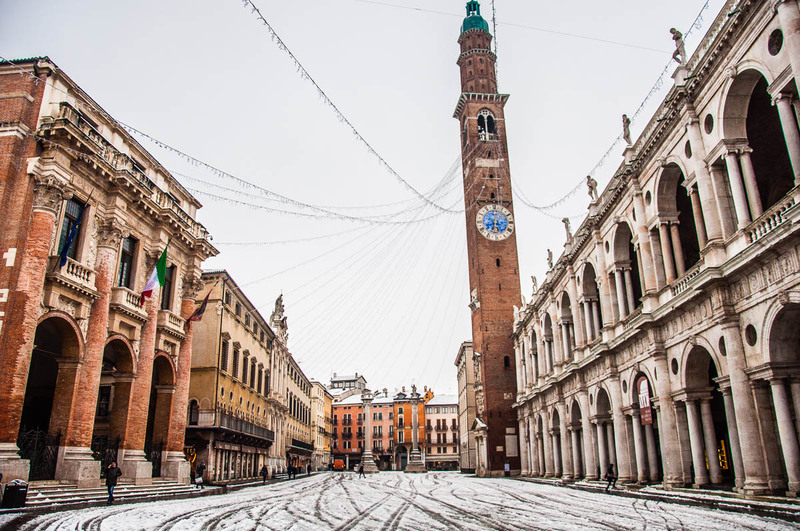 This is Vicenza’s Piazza dei Signori covered in snow. A rare but beautiful event! All roads in Vicenza lead to this gorgeous intersection of history and architecture. I must have taken a thousand photos of this square trying to capture its beauty and the uplifting feeling it fills me with every time I walk on its stone pavement. And this for me encapsulates the beauty of Vicenza in the fullest possible way. The End! 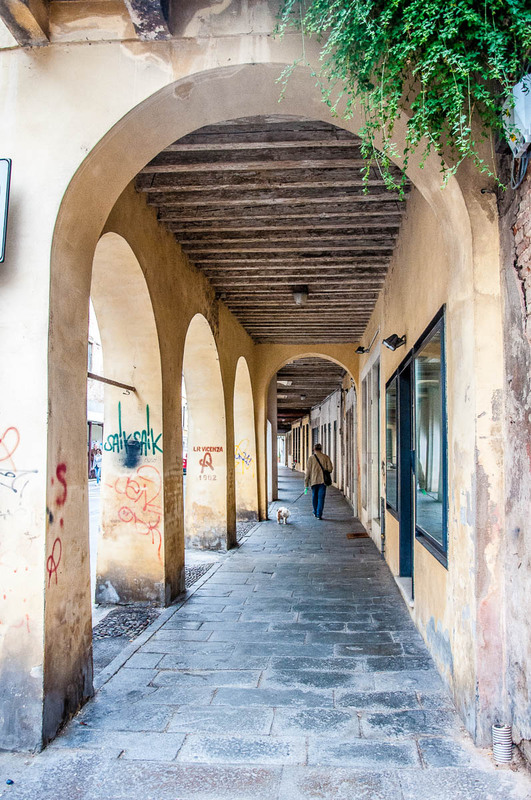 I hope that you enjoyed this little walk in 30 photos and stories through the streets of Vicenza, Italy and that you felt its beauty with your eyes and soul. 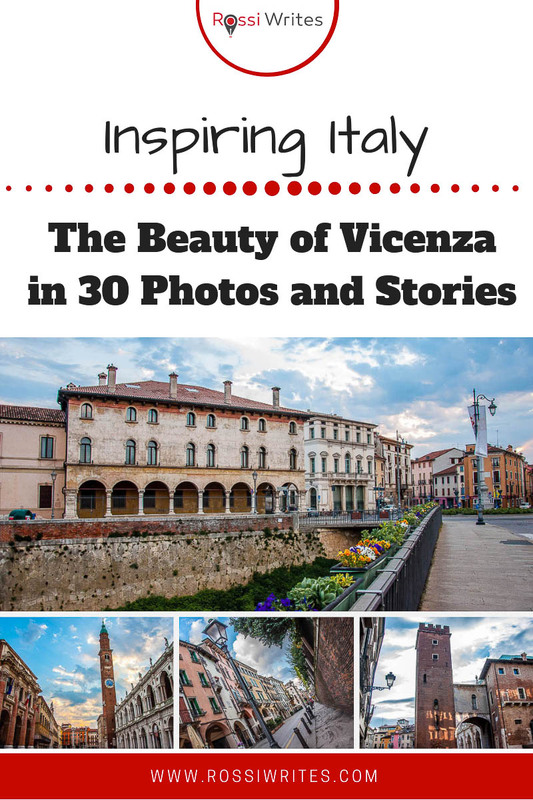 Have you been to Vicenza yourself? What was the thing you loved seeing here and what is the most beautiful memory you hold of this smaller Northern Italian city? If you haven’t been here yet, please, let me know what for you encapsulates the beauty of the place you currently live in? Beautiful Vicenza <3 For me the best place is Monte Berico and the peacful view of the Vicenza from above. It is a great view! Very inspiring!